Now closed; was a Sri Lankan restaurant in West Hampstead. As of July 2013 it's empty photo of exterior, photo taken through window with a bailiff's letter in the window dated October 2012 photo. 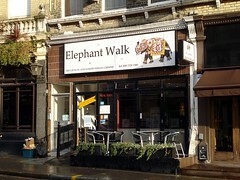 Sri Lankan restaurant in West Hampstead, very near the station(s). They also do some South Indian food. The restaurant, which opened in June 2005, won "Best Sri Lankan" in the 2006 and 2007 Cobra Good Curry awards, and is also recommended by Charles Campion, who praises the "uncluttered modern design" as well as the food. They also do takeaway, and will deliver. Kake, Ewan, Jo, and Ben visited early on a Saturday evening in November 2008. We hadn't booked, but this wasn't a problem; we were the only customers apart from one couple and one group of half a dozen who arrived towards the end of our meal. They asked us how spicy we wanted our food; we asked for medium, which was a mistake as it turned out to be really quite mild, nothing like as spicy as the "medium" food Kake had recently had at Jaffna House and Madras. Online reviews suggest that they generally do tone down the spicing for British palates, so next time I'd ask for more heat. For mains, we shared kothu rotti (a stirfry of chopped flatbread, egg, and vegetables; £9.45 including relishes and a dish of vegetable curry) and also a couple of orders of string hoppers (thin rice noodles; £4), which we accompanied as suggested on the menu with some kiri hothi (a thin sauce based on coconut milk; £2.50) and a couple of vegetable curries; dry aubergine curry and pumpkin curry (both £3.50). We also had a couple of paratha (£1.80 apiece) and some plain rice (£2.25) on the side. They seemed a little confused by us wanting to share (not really sure why this came as a surprise, since Kake ordered for all of us), but this was soon sorted out. It was all pretty tasty, though the mildness of the spicing as mentioned above was a little disappointing. Nothing was greasy, and the different dishes had quite distinct flavours. Kake and Ewan both particularly liked the aubergine curry, and Ewan was very keen on the parathas. We finished with a single order of banana fritters (£3-something), which were good, hot and crisp and not too greasy. We ended up paying £22/head in total including service and a couple of bottles of house wine, which is pretty good value. Service was fine, and very friendly, with the only real problem being that we hadn't in fact intended to have the house wine - Ewan actually ordered a pinot noir but they brought the house wine instead and we failed to notice in time. They had no problem bringing us tap water. Kake's verdict: More upmarket in terms of both food and decor than the other Sri Lankan places I've been to in London. I'd come back if I was in the area, and although it's across London from me I might even come here on purpose (though the journey is relatively easy for me, living on the Jubilee Line). I'd certainly like to give their food a go with a proper level of heat in it. Accessibility: Ramp to get in. Toilets are down a flight of stairs. It's quite small inside with not much room to manoeuvre. Last visited by Kake, Ewan, Jo, and Ben, November 2008. Last edited 2013-07-30 10:25:06 (version 8; diff). List all versions. Page last edited 2013-07-30 10:25:06 (version 8).